Financial Partners: U.S. Bank, N.A., U.S. Bank CDC, USDA-RD 514, USDA-RD 521, HCD-Multifamily Housing Program, HCD- Joe Serna Jr. Farmworker Housing Grant, County of Riverside, Federal Home Loan Bank, CDLAC, and TCAC. Built in the 1930s, the Fred Young Farm Labor Center in Indio, CA, was originally designed to temporarily house single migrant farmworkers. At the time, the complex had one-room wooden shacks. Eventually, families began to move into the units. In the 1960s, the U.S. Department of Agriculture Rural Development tore down the wooden shacks and replaced them with the existing 253 cinder-block units. After years of mismanagement CVHC took the reins in 2007 and started an effort to rejuvenate this disadvantaged community. 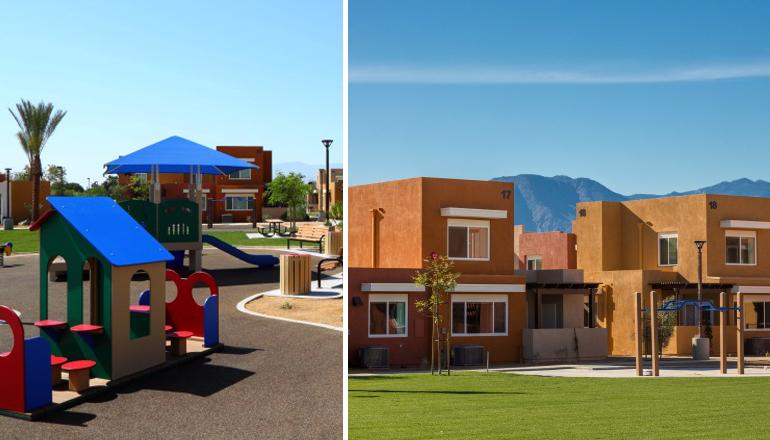 In 2014 CVHC completed the 85-unit first phase of replacement housing, named Villa Hermosa Apartments. This 100% farmworker development is designed for seniors and large families with units from 1bedroom to 4 bedrooms. The spacious community building hosts an after-school program, computer literacy classes, STEM Technology Program, Summer Tennis Camp, and other enrichment programs.